Lindsey Berg has played the last few years on a sore left knee. Surgery and a lengthy rehabilitation are planned, but not before the 28-year-old makes her second Olympic appearance. There is a joy, one of accomplishment and survival. Sixth in a series by staff writer Cindy Luis profiling the Islands' athletes competing in next month's Beijing Games. 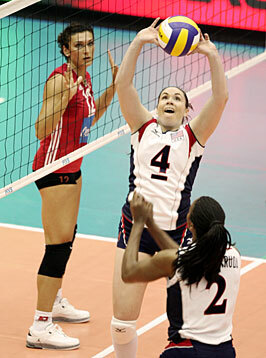 Such is the journey of setter Lindsey Berg in making a second Olympic team. The Punahou ('99) graduate has competed against the odds (listed at 5-foot-8) with distinction, making her second consecutive Olympic team. The last few years on a bum left knee. Surgery is planned, as well as a lengthy rehab. Some of it is physical, some of it mental, all of it designed to have her in the best shape for whatever comes after the Beijing Olympics. But for now the focus is on having the U.S. win its first medal in Olympic women's volleyball since a bronze in 1992. Berg, considered a backup to former University of Hawaii All-American Robyn Ah Mow-Santos, is ready. "I'm very happy to have made the team," Berg said. "I think we're coming back with a veteran team with some fresh faces. "We have a lot of depth and are getting a spark from the new players. There are six or seven teams that can win the gold. Our goal is to get better, one day at a time. Our goal is to win that first game." The U.S. opens the quest for its first gold medal in women's volleyball on Aug. 9 against Japan (4 p.m. Hawaii time next Friday). The pool also includes Cuba, Venezuela, host China and Poland. » Career highlights: Split time with Robyn Ah Mow-Santos at the 2004 Games, team finished tied for fifth. ... Named "Best Setter" at Pan American Cup (2003, '04, '05), at the 2005 NORCECA Championships and during two of the three legs of the 2006 World Grand Prix. ... A three-time All-Big Ten selection at Minnesota (1999-2001). ... Named Outstanding Server, Outstanding Setter and all-league for the now-defunct USPV. » Fun fact: Berg is the first player from the University of Minnesota volleyball program to make the Olympic team. Berg's dad, Dennis, coached UC Santa Barbara's club team that had Hawaii coach Dave Shoji and Minnesota coach Mike Hebert on it. "Our pool is easier than the last time," Berg said. "But we still have tough competition. We want to make it out of our pool, win that quarterfinal and take it step by step." Berg has made those strides, beginning at Minnesota, where she was a three-time All-Big Ten selection for the Gophers (1999-2001). She also was named outstanding server, outstanding setter and all-league for the now-defunct USPV when playing for the league champion Minnesota Chill. She now gets to walk through the tunnel and onto the field during the Parade of Nations for her second Opening Ceremony. "It's indescribable, walking into the stadium," Berg said. "I am so happy to make the team, make this Olympics. "We had a good Grand Prix (finishing fourth) without a set lineup. We've worked hard in the gym." As confident as Berg is, she knows she likely is the No. 2 setter, behind Ah Mow-Santos (McKinley '93). "And that's how it should be," Berg said. "As far as I'm concerned, Robyn should be starting. She has so much experience. I do have the skills but I see her leading us to a medal. "It's such an honor to play and learn from her, have her treat me as an equal. Our relationship is great. I think it shows the strength of volleyball in Hawaii to have us both be here, to have so many players who either played or were raised in Hawaii." 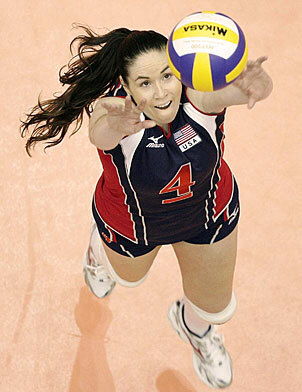 Setter Lindsey Berg, a Punahou alum, competes in her second Olympics this month. Besides Berg and Ah Mow-Santos, the Hawaii ties include UH All-Americans Heather Bown and Kim Willoughby, and Stanford All-American Logan Tom, who is part-Hawaiian. Berg's volleyball roots are intertwined with isle volleyball. Her father, Dennis, a multi-USVBA All-American at Outrigger Canoe Club, coached the UC Santa Barbara club team that had Rainbow Wahine coach Dave Shoji and Minnesota coach Mike Hebert on the roster. Berg's parents have since relocated to Santa Barbara, Calif., which allows them to travel and watch Lindsey's competitions. Dennis and Tina Berg will be in Beijing later this month. "Obviously, we're happy she made the team," Dennis Berg said. "We're keeping our fingers crossed that she'll be playing more at this Olympics than the last time. "It's kind of cool that there are so many Hawaii kids on the team. It says a lot for the quality of volleyball in the islands. It's a great connection for them to have. It's very special." Dennis Berg said he won't be returning to Honolulu when Minnesota plays UH on Sept. 4. He will be in Minneapolis when the Gophers host North Carolina on Sept. 20 when his oldest daughter Erin Berg Lindsey (Punahou '95) is on the bench as the Tar Heels' assistant coach. "I give Lindsey all the credit for making this team," Dennis Berg said. "She's played through a lot of pain, and is going to need surgery soon. "It's going to be a bit of a shock for her, not to be playing volleyball. But the doctor told her if she wants to rehab properly she ought to take the year off." And that's what Lindsey Berg intends to do. AFTER, she hopes, the U.S. medals. The Americans took fourth last month in the FIVB Grand Prix, with multiple lineups that led to erratic performances and less consistency that the team had hoped for. The shakeup was by design, according to coach Lang Ping. "Lindsey played a little more (than Ah Mow-Santos)," Lang said. "We know we can switch the two and still keep our rhythm. "I think it's great to have the two setters. Bergie as the co-captain gives us much energy." After Beijing, Berg intends to take the year off to rehab her left knee. She'll spend the time mulling her future as well. "I'd love to play a couple of more years," said Berg, who has been playing in Italy the past four seasons. "I'll have surgery, take time to recover and go from there. "I have a passion for fashion, would love to have my own store. (Her degree is in business and marketing). That's what drives me. That and volleyball."